Andrey Zharov is a Patent Counsel for the IPR Group. Andrey became a part of the IPR Group in March of 2014 and has since been advising clients on a wide range of patent-related issues, preparing hundreds of inventions, utility models and design applications, handled ownership changes with regards to patents, as well as advising on patent infringement matters. In addition, he prepares and drafts assignment recordals. Andrey obtained his Bachelor’s Degree in Mechanical Engineering from the National Technical University of Ukraine “Kiev Polytechnic Institute” from 2008 to 2012. He went on to obtain a Master’s Degree with Honours also in Mechanical Engineering and from the same University from the year 2012 to 2014. 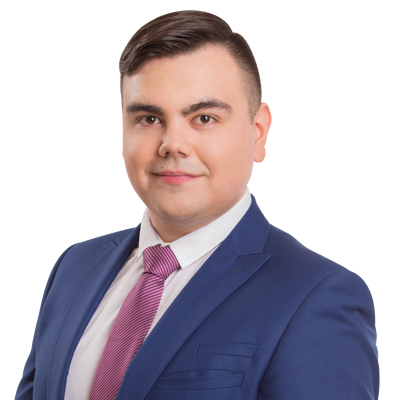 Andrey also has a Masters degree with Honours in Intellectual Property Management, from the Institute of Intellectual Property of the National University of Law in Kyiv. While studying his Master’s in Mechanical Engineering, Andrey worked for two years at a factory where he solved difficult technical and industrial problems as the Process and Structural Engineer. And thanks to his extensive education, presently he provides quality services for the protection of intellectual property rights in the field of technology. Andrey currently works with patent cases within Ukraine and the CIS region. He is passionate about his job especially since, according to him, “It enables people protect themselves and more specifically their knowledge and achievements, i.e. intellectual property”. An assured, cheerful and persistent person who always knows what he wants; Andrey is versatile and thoughtful, works qualitatively and is constantly learning new things in order to maximize an understanding of himself and the world around him. His hobbies include fishing, travelling (he has plans to visit every continent), and learning technical innovations.